Last week I listed the six most influential author's of detective stories. This week's post begins the biographies of those writers. William Collins was born and raised in the fashionable London district of Marylebourne. Wilkie, as he was affectionately known, then spent the remainder of his life within the same few blocks. Curiously, the fictional home of Sherlock Holmes also was located in the district at 221B Baker Street. By any standard, Collins led an unconventional life. Early on he became a story-teller. At boarding school, the short, stout boy with the disproportionately large head and shoulders with a lump on his forehead, and with small hands and feet, began spinning tales to appease a bully. His ungainly physical attributes, however, seemed no burden to Collins. He seems to have used himself for the model of Count Fosco, one of the principle characters in The Woman In White. Initially a journalist, at 24 he entered law school and passed the bar in 1851; but he never practiced. He had begun writing fiction in 1843 and his first story appeared in a popular illustrated magazine. His first novel, inspired by the death of his father, was The Memoirs of the Life of William Collins, Esq., R.A. The book was published in 1848, receiving good reviews. Wilkie never looked back. Writing afforded him the financial wherewithal and the freedom to cultivate his bohemian preferences. He remained a lifetime bachelor, though he did live with several women. He indulged in good food, good drink, often to excess. 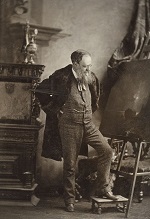 Wilkie wore flamboyant clothes, frequently traveled to France and Italy, was widely read, and maintained a vigorous sense of humor. Despite his apparent joie de vivre, his health was often poor. To relieve the symptoms of his many ailments, he took larger and larger doses of laudanum, a tincture of opium, which was a common medication of the 19th century. His wide circle of friends included Charles Dickens; and for many years Collins provided material for Dickens' magazines. The Woman In White, No Name, Armadale, and The Moonstone were his best known works. During his lifetime he wrote over thirty major books, hundreds of articles, short stories and essays, and a dozen plays. He was noted for his cynical regard for the Victorian establishment, and for championing the many victims of the prevalent social injustices. As we shall see, that cynical regard for establishment would become a major theme in all subsequent detective fiction.